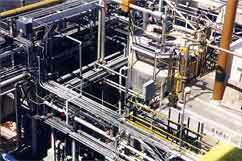 With today's emphasis on process safety and OSHA 1910 compliance, selection of suitable materials of construction for chemical processes is a critical step in designing or modifying plant equipment. MSR will work very closely with your engineering team to identify the most-cost effective materials that provide adequate resistance to chemical environments. The selection process involves: process review, identification of materials issues, development of an appropriate test program, interpretation of results, selection of materials of construction, and finally, development and implementation of the corrosion monitoring program.